An exhibition of artwork made on coasters, or constructed using coasters. This fun summer show will included dozens of artist and creatives at all career levels and skill sets. We are exhibiting work from Chicago artists and those beyond the Midwest . Coaster sizes and shapes will vary, that's not too important. They will be admitted based on their creativity and content. The exhibition Opens June 13 at Cobalt Studio 1950 W. 21st Street [1st] Chicago IL 60608 The show runs June 13 - July 13. With extended viewing hours on weekends and by appointment. All unsold work must be picked up by July 13th. Hours will be posted soon. 1. Once accepted. All work must be delivered to Cobalt Studio by June 8. 2. ALL work must be made on coasters or of coaster construction. 4. NO long Artist Statements or Bios required. Submit NO more than 100 words. 5. All 2-D work must be ready to hang. Unframed pieces are fine, and will be hung using pins or removable adhesive. Frames [not required] have to mount easily to a hook or nail. 6. ANY: pedestals, must be provided by the artist, including any specialized hardware. 7. Transportation of the work to and from Cobalt Studio is the responsibility of the Artists. 8. Submissions sent via mail will not be returned...unless they include a self addressed- stamped envelope with sufficient paid postage. Use the US Postal Service. Cobalt is not responsible for lost packages. Cobalt Studio is not open regularly to accept packages from other delivery services; NO FedEx, NO UPS. 9. All unsold work must be collected by July 10-13. 10. [image submissions not required] If you insist on sending images submit NO more than five quality ".jpg" files 2MB or less, of detailed shots of the work via email to cobaltartstudio[aT}gmail[dOT}com. [Label them using the initials of the artist and the appropriate ".jpg" format.] 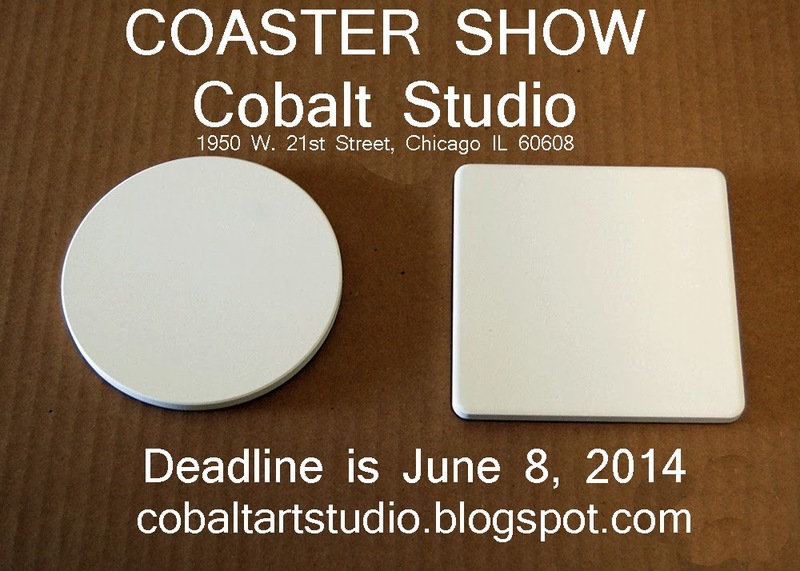 Cobalt will use images to promote the Coaster Show 2014. 10.Coasters may be different shapes and sizes. Cobalt reserves the right to exclude any submissions for any reason.